Before I get to the toy itself, I must talk about the stickers. Most of his detail is stickers rather than paint apps. I think I understand why that is, his stickers mostly consist of tiny text blurbs and some people might choose not to put them on the toy. These kind of stickers were common on a few G1 toys (Omega Supreme comes to mind, possibly Roadbuster too, I don’t recall) and many GI Joe toys. The photo on the back of the box is clearly painted and looks much better. I would have preferred they just leave them out. They really don’t do anything to improve the toy. Also, the stickers are horribly designed. Many if not most of them don’t fit properly where they are suppose to go. 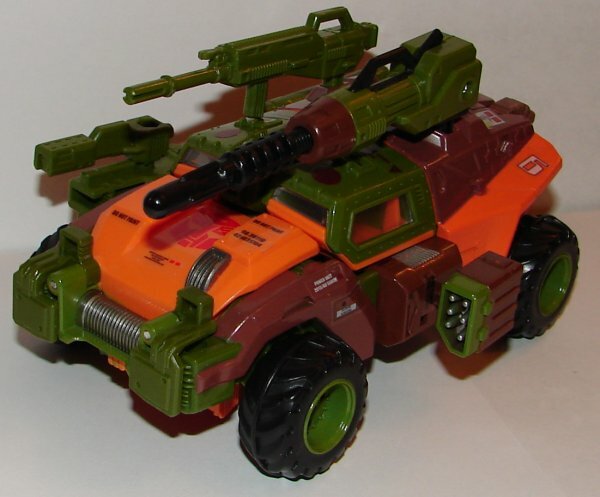 Vehicle Mode: Roadbuster is awesome. His original G1 vehicle was more like a jeep, while this is like an armored Humvee, but it looks awesome. The colors are perfect and he’s armed to the teeth. If you look at his rear fender in the picture where the number 6 is, right above that is a port that the instructions say is supposed to hold one of his guns. Unfortunately, it’s nowhere near deep enough. Not sure if it’s a problem with mine or if whoever was making up the instructions wasn’t paying attention. It’s a minor thing. Robot Mode: His robot mode looks awesome. I really like his head sculpt. He comes with another Autobot sticker, a blue Wreckers version, but I prefer the original Autobot symbol. Some of his weapons can be put into different configurations (true on his vehicle mode as well). His main gun is very much like his G1 gun. 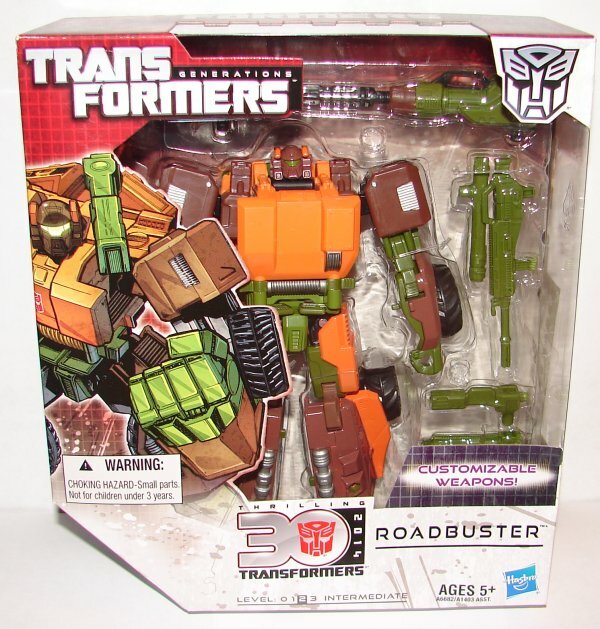 Overall: Roadbuster is a must for every Transformers fan. 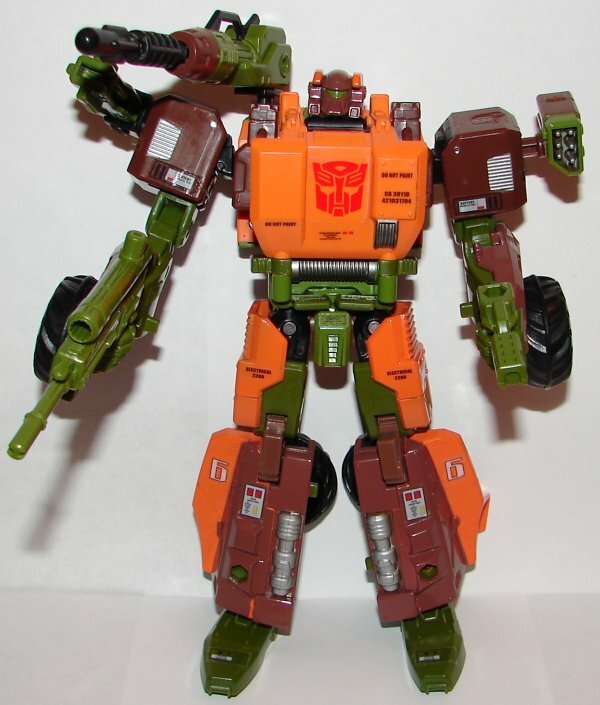 This entry was posted in Toy Reviews, Toys, Transformers and tagged Generations, Roadbuster, Toys, Transformers. Bookmark the permalink.